Tamannaah Bhatia (born 21 December 1989) is an Indian actress who predominantly appears in Telugu and Tamil films. She has also appeared in several Hindi films. In addition to acting, she also participates in stage shows and is a prominent celebrity endorser for brands and products. In 2005, she made her acting debut at the age of 15 in the Bollywood film, Chand Sa Roshan Chehra and appeared in the Abhijeet Sawant album song "Lafzon main" from the album Aapka Abhijeet, which was also released in 2005, before working in Telugu cinema and Tamil cinema. In the same year, Tamannaah made her Telugu film debut in Sri, and the next year she appeared in her first Tamil movie, Kedi. In 2007, she starred in two college-life-based drama films, Happy Days in Telugu and Kalloori in Tamil. Her projects include the successful Tamil films Ayan (2009), Paiyaa (2010), Siruthai (2011), Veeram (2014), Dharma Durai (2016), Devi (2016), Sketch (2018) and her Telugu films include 100% Love (2011). Other films include Racha (2012), Thadaka (2013), Baahubali: The Beginning (2015), Bengal Tiger (2015), Oopiri (2016) , Baahubali 2: The Conclusion (2017) and F2 – Fun and Frustration (2019). She thus established herself as one of the leading contemporary actresses in Telugu cinema and Tamil cinema. She is one of the highest paid actresses in South Indian cinema. She has acted nearly 60 films in three different languages. She is the first actress from India who was nominated at Saturn Awards for Best Supporting Actress. She also received the "Dayawati Modi" Award in 2017. She also received an honorary doctorate from CIAC, in association with KEISIE International University, South Korea for her contributions to Indian cinema. Tamannaah Bhatia was born on 21 December 1989 in Mumbai, Maharashtra, India, to Santhosh and Rajani Bhatia. She has an elder brother, Anand. Her father is a diamond merchant. She is of Sindhi descent. She did her schooling in Maneckji Cooper Education Trust School, Mumbai. She later changed her screen name for numerological reasons, varying it slightly to Tamannaah. She has been working since the age of 13, when she was spotted at her school's annual day function and offered a lead role, which she took up, and then also became a part of Mumbai's Prithvi Theatre for a year. She also appeared in Abhijeet Sawant's album song "Lafzo Mein" from the album Aapka Abhijeet, which was released in 2005. In 2005, at the age of 15, she played the female lead in Chand Sa Roshan Chehra, which was a commercial failure at the box office. The same year, she made her debut in Telugu cinema with Sri and in Tamil cinema with Kedi in 2006. IndiaGlitz in its review called Tamannaah the "real scene-stealer" and stated that she "walks away with all honors", adding that her characters have shades of the characters played by Vijayashanti in Mannan (1992) and Ramya Krishnan in Padayappa (1999). Her first release of 2007 was Shakti Chidambaram's Viyabari, in which she played the role of a journalist who wants to write an article about a successful entrepreneur played by S. J. Suryah. The film opened to negative reviews and flopped at the box office, but Tamannaah received praise for her performance. She got her breakthrough with Sekhar Kammula's Happy Days and Balaji Sakthivel's Kalloori, both of which featured Tamannaah as a college student. She won critical acclaim for her performances in both films. The commercial success of Happy Days and Kalloori established her career as an actress in both Telugu and Tamil films. Her performance in the latter earned her a nomination at the 56th Filmfare Awards South in the Best Tamil Actress category. Her first release of 2008 was the Telugu film Kalidasu, directed by debutante G. Ravicharan Reddy. She was paired with debutante Sushanth, the grandson of actor Akkineni Nageswara Rao. Upon release, the film opened to moderate reviews and critics felt that she looked good and very romantic, but had less scope to perform. The film was an average grosser at the box office. She later made a cameo appearance in the Telugu film Ready, followed by another cameo appearance in the Telugu - Tamil bilingual Ninna Nedu Repu, titled Netru Indru Naalai in Tamil. Tamannaah's first release of 2009 was the Tamil film Padikkadavan, directed by Suraj and co-starring Dhanush, which was named after Rajinikanth's 1985 film of the same name. The film received mixed reviews from critics, but Tamannaah's performance in a limited role won praise. Padikkadavan however, became a commercial success. Her next release was the Telugu film Konchem Ishtam Konchem Kashtam, directed by Kishore Kumar Pardasany, co-starring Siddharth. The film received positive reviews from critics and she received critical acclaim for her performance, earning a nomination at the 57th Filmfare Awards South in the Best Telugu Actress category. The film, however, was an average grosser at the box office. Her next release, K. V. Anand's Ayan, co-starring Suriya, became the only major commercially successful Tamil film of the year. She later appeared in Gandhi Krishna's Ananda Thandavam, which was based on the novel Pirivom Santhippom serialised by Sujatha Rangarajan. She was paired with Siddharth Venugopal in the film, marking the latter's debut. The film opened to negative reviews, and was her only commercial failure in 2009. However, Tamannaah's performance was critically acclaimed. Pavithra Srinivasan of Rediff.com stated that Tamannaah's "would-be innocence when she's playing up to Sidharth, and slight cunning when she chooses Radhakrishnan is perfect" adding that she brought her character Madhumitha "to life, an alluring mix of child and woman; irritating, sly, yet arousing your sympathy in the climax". Tamannaah later appeared in R. Kannan's Kanden Kadhalai, the official remake of Jab We Met (2007), co-starring Bharath. Her voice was dubbed by playback singer Chinmayi. Kanden Kadhalai opened to decent feedback from critics and Tamannaah's performance won praise from them. A reviewer from Sify stated: "Funny and full of life, it is Tamannaah who is the heart and soul of this love story. She has come up with a live wire performance and the magic of the film lies in her performance", adding that no actress in Tamil cinema could play that role better than her though she did not look like a Thevar girl hailing from Theni. Her performance in the film earned her a nomination at the 57th Filmfare Awards South in the Best Tamil Actress category, making her the only actress to earn two nominations in two different languages at that event. She also won the South Scope award for the same. During this phase, she was established as an undisputed top actress in Tamil cinema. Tamannaah's first release of 2010 was N. Linguswamy's Paiyaa, co-starring Karthi, which was a Tamil road movie. The film opened to positive reviews from critics and was a commercial success. She earned a nomination each at the 58th Filmfare Awards South and 5th Vijay Awards in the Best Tamil Actress category. Her other two releases of 2010 were S. P. Rajkumar's Sura, co-starring Vijay and M. Raja's Thillalangadi, co-starring Jayam Ravi, the former being Vijay's 50th film as an actor and the latter being the official remake of Surender Reddy's Kick (2009). Both the films flopped at the box office. Tamannaah's first release of 2011 was Siva's Siruthai, co-starring Karthi, which was the official remake of S. S. Rajamouli's Vikramarkudu (2006). Her character was received poorly by critics, with Pavithra Srinivasan of Rediff.com citing that she offered "little more than arm-candy". The film, however, was commercially successful. She followed it with a cameo appearance in the song "Aga Naga" from K. V. Anand's Ko. She made her comeback to Telugu cinema after a two-year gap in the same year with Sukumar's 100% Love, co-starring Naga Chaitanya, in which she played the role of a village girl visiting her cousin's house in Hyderabad for pursuing higher education. She won praise for her performance from the critics. A reviewer from IndiaGlitz stated that Tamannaah "stole the show in the film" and "doesn't over act or underplay her role anywhere". The reviewer added that she "is drop dead gorgeous and steals your heart with her beauty" and "wins on two counts-one is her endearing action and two is her insanely adorable looks". The film became one of the biggest commercial successful Telugu films of 2011. She earned a nomination each at the 59th Filmfare Awards South and 1st South Indian International Movie Awards in the Best Telugu Actress category. She also won the Best Actor Female awards at CineMAA Awards 2012 and The Hyderabad Times Film Awards 2011. Her next release of 2011 was V. V. Vinayak's Badrinath, co-starring Allu Arjun. Her looks in the film became debatable considering her girl-next-door looks sported in her previous films. The film received mixed to negative reviews from critics. Suresh Kavirayani of The Times of India felt that Tamannaah was "energetic, but there was unnecessary skin show even in scenes that didn't seem to require it". However, the film became a notable success at the box office. She earned a nomination at the CineMAA Awards 2012 in the Best Actor Female category. She played the role of a village girl in Hari's Venghai, co-starring Dhanush, whom she called a "subtle and underplayed" character. Both the film and her performance opened to mixed reviews from critics, with Pavithra Srinivasan of Rediff.com stating that Tamannaah "appears neatly attired in classy dresses but suddenly takes to wearing skimpy clothes that display her midriff" and looks "so dazzlingly white that you want to reach for your sun-glasses". Her next release Oosaravelli, co-starring N. T. Rama Rao Jr. and directed by Surender Reddy, opened to mixed reviews from critics, and was a commercial failure. Tamannaah starred in four Telugu films in 2012, the first one being Sampath Nandi's Racha, co-starring Ram Charan, in which she played the role of a rich girl living in a protected world whose character's layers are revealed as the film progresses. 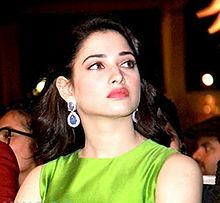 Upon release, Tamannaah received praise from the critics with Sify's reviewer calling her the film's "major asset", and Karthik Pasupulate of The Times of India stating that she "does the needful" and "does add more than glamour value to the film". The film was declared a major commercial success by the end of its 50-day run. She earned a nomination each at 60th Filmfare Awards South and CineMAA Awards 2013 in the Best Actor Female category. Her next release, A. Karunakaran's Endukante... Premanta!, co-starring Ram, opened to negative reviews and was a commercial failure. However, critics praised hers and Ram's performance in the film, with Y. Sunita Chowdary of The Hindu stating that they have "done their best to bring some semblance of reality to this fantasy", and Radhika Rajamani of Rediff.com calling them the film's "heart and soul". Her third release, Raghava Lawrence's Rebel, co-starring Prabhas, in which she played a hip hop dance teacher, opened to mixed reviews and was a commercial failure and escalation of budget was cited as one of the primary reasons. Her last release of 2012 was Puri Jagannadh's Cameraman Gangatho Rambabu, co-starring Pawan Kalyan, in which she played the role of a tomboyish media cameraman. The film was one of the biggest commercial successful Telugu films of 2012. Tamannaah's first release of 2013 was Sajid Khan's Himmatwala, co-starring Ajay Devgan, which was the remake of the 1983 Hindi film of the same name, where she reprises the role of Sridevi from the original. Khan chose her considering her popularity in the South Indian cinema and the film marked her comeback to Hindi cinema. The film opened to negative reviews from critics, who felt that she matched Sridevi in terms of glamour, but failed in terms of acting skills which they termed as "below average". Himmatwala became a commercial failure at the box office. Her other release of 2013 was Kishore Kumar Pardasany's Tadakha, co-starring Naga Chaitanya, Sunil and Andrea Jeremiah, the official Telugu remake of N. Lingusamy's Vettai, where she reprises the role played by Amala Paul in the original. The film opened to moderate reviews from critics, and was commercially successful. She earned a nomination at the 3rd South Indian International Movie Awards in the Best Actor Female category. She made her comeback to Tamil cinema in 2014 after a sabbatical of three years with Siva's Veeram, co-starring Ajith Kumar. She said in an interview that she was in talks for a lot of Tamil films and would be signing a few soon. Veeram received positive reviews from critics, and became one of the highest grossing Tamil films of 2014. She again collaborated with Sajid Khan for the film Humshakals as one of the female leads. The film co-starred Saif Ali Khan, Ram Kapoor, Riteish Deshmukh, Bipasha Basu and Esha Gupta. The film received poor reviews from critics, and flopped at the box office. Tamannaah received a nomination at the 7th Golden Kela Awards in the worst actress category. She performed her first item number in V. V. Vinayak's Alludu Seenu, featuring Bellamkonda Sreenivas and Samantha Ruth Prabhu in the lead roles which she accepted to do upon Vinayak's request after walking out of the film initially due to changes in its script. That song, titled "Labbar Bomma", was well received by the audience. In her next release, Entertainment, directed by Sajid-Farhad, co-starring Akshay Kumar, she played the role of a television actress. While the film was a semi-hit at the box office,  Her last release of 2014 was Srinu Vaitla's Aagadu, co-starring Mahesh Babu, in which she played the role of a village belle owning a chain of sweet shops. The film opened to mixed reviews and was a commercial failure at the box office. She later made a cameo appearance as herself in Jagadish's Nannbenda, starring Udhayanidhi Stalin and Nayantara. She also dubbed her own voice for the same. In July 2015, the first part of S. S. Rajamouli's two-part multilingual fictional epic film Baahubali, co-starring Prabhas, Rana Daggubati and Anushka Shetty, was released. She played the role of Avanthika, a Warrior Princess of an unspecified era. For her role, she had to lose five to six kilos of weight and also, special care was taken regarding the looks, costumes and jewelry of her character. The film received positive reviews from critics and Tamannaah was praised for her performance. The movie collected around ₹650 crore (US$90 million) and eventually became the top grosser of Telugu cinema and third highest grossing Indian film. Her next release was M. Rajesh's Vasuvum Saravananum Onna Padichavanga, co-starring Arya, N. Santhanam and Bhanu, in which she would showcase her own jewelry designs from Wite & Gold. The film received negative reviews from the critics. Later, she made a cameo appearance in the bilingual film Size Zero, which features Arya, Anushka Shetty and Sonal Chauhan in the lead roles. She performed her second item number in Bhimaneni Srinivasa Rao's Speedunnodu, featuring Bellamkonda Sreenivas and Sonarika Bhadoria in the lead roles, which released in February 2016. She charged half of her remuneration to appear in that song, titled "Bachelor Babu", which was made on a budget of ₹2.25 crore (US$310,000). Her next release was Vamsi's Oopiri, which is a remake of The Intouchables (2011), co-starring Akkineni Nagarjuna and Karthi, being filmed in Telugu and Tamil simultaneously. The film opened to positive reviews. Her next release was the Tamil film Dharma Durai, In which she played a doctor and she also appeared in the film without makeup and it opened to positive reviews. The film also ran successfully in box office. Her next release was a Short Film - Ranveer Ching Returns with Ranveer Singh, directed by Rohit Shetty and it received positive reviews from critics. In October 2016, Tamannah released her third item number in the Telugu-Kannada bilingual film Jaguar. Her next release was female oriented trilingual (Tamil—Telugu—Hindi) film Devi. For the first time, she appeared in double role in full length and in her first horror film in three different languages and it also opened to positive reviews. She has also been praised for her acting in the film and the film collected ₹100 crore (US$14 million) at box office, in three languages. and her last release in 2016 was Kaththi Sandai, co-starring Vishal. It opened to mixed reviews from critics and became commercial failure. Her first release in 2017 was Baahubali 2: The Conclusion. In this film, Tamannaah plays a role of Avanthika, a member of a rebel group who wants to rescue Devasena from an evil Bhallaladeva and finally got married with Shivudu / Mahendra Baahubali and become a Queen of Mahishmati Kingdom. The film received highly positive reviews from critics and collected ₹114 crore (US$16 million) in its first day itself all over India and eventually this was the first Indian film collecting more than ₹100 crore (US$14 million) in its first day. It became the first Indian film to get a worldwide gross of more than ₹500 crore (US$70 million) in all languages in just three days. It became the highest grosser Of all time in India in all languages in five days, grossing ₹565 crore (US$79 million). It became the highest grossing Indian film ever, with a worldwide gross of ₹800 crore (US$110 million) in all languages in just six days, surpassing PK's worldwide gross of ₹742 crore (US$100 million). Baahubali 2 became the highest grossing Indian film ever with worldwide gross of approx. ₹900 crore (US$130 million) in all languages in just seven days, surpassing PK worldwide gross of ₹792 crore. On the 9th day, Baahubali 2 became the first Indian film ever to collect ₹1,000 crore (US$140 million). Her next release in Tamil was Anbanavan Asaradhavan Adangadhavan also known as AAA, is an Indian two-part Tamil-Language action comedy film with Silambarasan for the first time. The film opened to mixed reviews and commercial failure. Her next release was fourth item song in Jai Lava Kusa's "Swing Zara", along with N. T. Rama Rao Jr, directed by K. S. Ravindra. Her first release in 2018 was Vikram's Sketch, directed by Vijay Chander on Pongal day along with Thaanaa Serndha Koottam and Gulaebaghavali. Sketch opened to mixed reviews from critics and audiences. Tamannaah was praised for her performance as she played the role as Amuthavali, a south Indian Brahmin girl in the film. Her next release was the Marathi film Aa Bb Kk. It opened to positive reviews and became a commercial success. Her next release was the Telugu film Naa... Nuvve, in which she was paired opposite Nandamuri Kalyan Ram for the first time. It opened to mixed reviews and was a commercial failure. Her next release was a Telugu film Next Enti? opposite Sundeep Kishan directed by bollywood filmmaker Kunal Kohli. The film opened to mixed reviews from critics and commercial failure. However, Tamannaah's performance was highly praised by the critics and audiences in both the movies. Her last release in 2018 was a Kannada film KGF along with Yash in which she made a special appearance in the item number. Her first release for 2019 is a Telugu film F2 - Fun and Frustration a comedy multi-starrer which stars Daggubati Venkatesh, Varun Tej and Mehreen Pirzada in lead roles. The film collected 140 crores at box office and became grand opening of telugu cinema of the year, while tamanaah acting praised by audiences and critics. Next, she released a strong female role Tamil film under direction of Seenu Ramasamy, Kanne Kalaimaane, with Udhayanidhi Stalin. Her acting praised by audiences and critics from Tamil Nadu. She completed her shoot for a telugu female centric film That Is Mahalakshmi, which was initially directed by Neelakanta Reddy. Due to creative differences between actress andi drector, Reddy was later replaced by Prasanth Varma. Tamannaah also completed another Indian female centric Tamil musical Gothic horror comedy film Devi 2, co-written and directed by A. L. Vijay. She appeared in her next Telugu film Sye Raa Narasimha Reddy with megastar Chiranjeevi and she also started to shoot for untitled Sundar C. film along side with Vishal again. In mid of march, she signed third installment of Raju gari gadhi 3 in Telugu. She also signed another film in Tamil with Vishal directed by a newcomer.She portrays a principal antagonist role in the film.Tamanna paired with Vishal 3rd time for this movie.She has signed another horror-comedy women centric movie in Tamil directed by Adhe Kangal fame Rohin venkatesan. She completed the remake of Nayanthara's yet-to-release film Kolaiyuthir Kaalam under the direction of Chakri Toleti, titled as Khamoshi in Hindi. But the film is getting delayed for unknown reasons. Tamannaah also has experience as a model appearing in various television commercials. She is endorsing popular brands like Celkon Mobiles, Fanta and Chandrika Ayurvedic soap. She is also the brand ambassador of the Salem based jewelry shop AVR and Khazana Jewellery. Before entering the film industry, she also acted in Tamil advertisements like Shakthi Masala, Power Soap and Sun Direct. She also worked with Virat Kohli for an ad shoot of Celkon Mobile. In 2014, she posed in a PETA advertisement, encouraging consumers to purchase cosmetics that have not been tested on animals. In March 2015, she also signed as a brand ambassador for channel Zee Telugu. On 31 March 2015, Tamannaah launched a retail jewelry business which is named Wite-n-Gold having malls at Mumbai and Bangalore. The website was started on 20 April 2015 marking the festival Akshaya Tritiya. She was also Creative head for her jewelry brand. In January 2016 she also became the brand ambassador of the Government of India's campaign Beti Bachao, Beti Padhao, an initiative of FOGSI. She reportedly charged Rs 50 lakhs for a 10 minute performance during the opening of IPL 2018 where she performed on four songs from four different languages of Telugu, Tamil, Kannada and Hindi. ^ a b "Tamannah's 'secret of success' – Tamil Movie News". IndiaGlitz. 1 June 2010. Retrieved 9 October 2012. ^ "Tamannaah Bhatia: Movies, Photos, Videos, News & Biography - eTimes". timesofindia.indiatimes.com. ^ "Tamil Nadu Govt announces Kalaimamani awards". The Hindu. PTI. 28 January 2011. ISSN 0971-751X. Retrieved 15 September 2017. ^ Abbasi, Mehfooz (25 July 2017). "After Shah Rukh Khan, Baahubali Actress Tamannaah Bhatia Receives An Honourary Doctorate". India.com. Retrieved 15 September 2017. ^ Sify (21 December 2010). "Happy birthday Tamannaah". Sify. Retrieved 23 April 2011. ^ a b c "Happy B'day to the Queen of K'wood!". Sify. 21 December 2009. Archived from the original on 18 June 2013. Retrieved 15 May 2015. ^ "Actress Tamannaah Bhatia Receives An Honourary Doctorate". www.india.com. 24 July 2017. Retrieved 26 July 2017. ^ "Tamannaah turns designer with new jewellery venture". ^ "tamanna bhatia anand - Google Search". www.google.com. ^ "Siren of the Week: Tamannaah Bhatia – 9". Entertainment.in.msn.com. 3 October 2009. Retrieved 9 October 2012. ^ "The Tamannaah Bhatia Interview : Of Baahubali and Bollywood". silverscreen. 27 June 2014. Archived from the original on 7 April 2016. ^ "More Happy Days". The Times of India. 26 May 2008. Archived from the original on 15 May 2015. Retrieved 15 May 2015. ^ "Kedi Movie Review - Love triangle". IndiaGlitz. 26 September 2006. Archived from the original on 15 May 2015. Retrieved 15 May 2015. ^ "Arun Pandian takes Vil away from Suryah". Behindwoods. 10 December 2007. Archived from the original on 15 May 2015. Retrieved 15 May 2015. ^ Iyer, Sriram (2 April 2007). "Poor detailing ruins Vyapari". Rediff.com. Archived from the original on 15 May 2015. Retrieved 15 May 2015. ^ a b Rajamani, Radhika (31 December 2007). "'I want to make a mark in the South'". Rediff.com. Archived from the original on 15 May 2015. Retrieved 15 May 2015. ^ Aggarwal, Divya (27 April 2008). "South for Stardom". The Times of India. Archived from the original on 15 May 2015. Retrieved 15 May 2015. ^ Sekhar, Settu (5 July 2008). "Rajini- Nayan nominate for Filmfare". Oneindia Entertainment. Archived from the original on 15 May 2015. Retrieved 15 May 2015. ^ "Review : Kalidasu". Sify. 11 April 2008. Archived from the original on 15 May 2015. Retrieved 15 May 2015. ^ "Kalidasu Movie Review - Sushant – Dance is his strength". IndiaGlitz. 11 April 2008. Archived from the original on 14 November 2012. Retrieved 15 May 2015. ^ "Kalidasu Review". Oneindia Entertainment. 11 April 2008. Archived from the original on 15 May 2015. Retrieved 15 May 2015. ^ Rajamani, Radhika (18 May 2009). "From Kalidasu to Current". Rediff.com. Archived from the original on 15 May 2015. Retrieved 15 May 2015. ^ "Choosy Tamanna!". The Times of India. 27 June 2008. Archived from the original on 15 May 2015. Retrieved 15 May 2015. ^ "Padikathavan– Movie Review". Behindwoods. 15 January 2009. Archived from the original on 15 May 2015. Retrieved 15 May 2015. ^ "Padikathavan Movie Review - Hotch-potch". IndiaGlitz. 15 January 2009. Archived from the original on 15 May 2015. Retrieved 15 May 2015. ^ "Dhanush in demand!". Sify. 18 January 2009. Archived from the original on 15 May 2015. Retrieved 15 May 2015. ^ "A feel-good entertainer". Rediff.com. 5 February 2009. Archived from the original on 15 May 2015. Retrieved 15 May 2015. ^ "Konchem Istam Konchem Kastam Movie Review - Feel Good Family Entertainer". IndiaGlitz. 5 February 2009. Archived from the original on 15 May 2015. Retrieved 15 May 2015. ^ a b "Nominations for 57th South Filmfare Awards". Oneindia Entertainment. 10 July 2010. Archived from the original on 15 May 2015. Retrieved 15 May 2015. ^ "Box-office report for first quarter 2009". Sify. 1 April 2009. Archived from the original on 15 May 2015. Retrieved 15 May 2015. ^ "2009's Top Tamil Actors". Rediff.com. 21 December 2009. Archived from the original on 15 May 2015. Retrieved 15 May 2015. ^ "2009- Kollywood Hits & Misses!". Sify. 31 December 2009. Archived from the original on 15 May 2015. Retrieved 15 May 2015. ^ Kumar, S. R. Ashok (10 May 2008). "Sujatha's novel on the big screen". The Hindu. Archived from the original on 15 May 2015. Retrieved 15 May 2015. ^ "Review : Ananda Thandavam". Sify. 10 April 2009. Archived from the original on 15 May 2015. Retrieved 15 May 2015. ^ "Aanandha Thandavam - Movie Review". Behindwoods. 10 April 2009. Archived from the original on 15 May 2015. Retrieved 15 May 2015. ^ a b Pillai, Sreedhar (2 April 2010). "Three cheers for Tammu!". The Times of India. Archived from the original on 15 May 2015. Retrieved 15 May 2015. ^ Srinivasan, Pavithra (10 April 2009). "Anandha Thandavam, not as good as the novel". Rediff.com. Archived from the original on 15 May 2015. Retrieved 15 May 2015. ^ Srinivasan, Pavithra (30 October 2009). "Kanden Kadhalai, good but lacks Jab We Met's magic". Rediff.com. Archived from the original on 15 May 2015. Retrieved 15 May 2015. ^ "Kanden Kadhalai Movie Review". Behindwoods. 30 October 2009. Archived from the original on 15 May 2015. Retrieved 15 May 2015. ^ "Kanden Kadhalai Movie Review". The Times of India. 30 October 2009. Archived from the original on 15 May 2015. Retrieved 15 May 2015. ^ "Review : Kanden Kadhalai". Sify. 30 October 2009. Archived from the original on 15 May 2015. Retrieved 15 May 2015. ^ "Prakash Raj & Tamannaah gets South Scope Awards". Sify. 20 September 2010. Archived from the original on 15 May 2015. Retrieved 15 May 2015. ^ Pillai, Sreedhar (7 April 2010). "Karthi: On road to superstardom". The Times of India. Archived from the original on 15 May 2015. Retrieved 15 May 2015. ^ "Nominees of Idea Filmfare Awards South". IndiaGlitz. 1 June 2011. Archived from the original on 13 November 2013. Retrieved 15 May 2015. ^ "Vijay awards Nominees list announced". Sulekha. 22 June 2011. Archived from the original on 15 May 2015. Retrieved 15 May 2015. ^ "Sura releasing big in Kerala". Sify. 29 April 2010. Archived from the original on 15 May 2015. Retrieved 15 May 2015. ^ "Jayam Ravi's Thillalangadi starts rolling!". Sify. 19 August 2009. Archived from the original on 15 May 2015. Retrieved 15 May 2015. ^ "Tamannaah waits for another hit!". Sify. 14 January 2011. Archived from the original on 15 May 2015. Retrieved 15 May 2015. ^ "First Look: Karthi in Siruthai". Rediff.com. 10 November 2010. Archived from the original on 15 May 2015. Retrieved 15 May 2015. ^ Srinivasan, Pavithra (14 January 2011). "Siruthai is Karthi's show all the way". Rediff.com. Archived from the original on 15 May 2015. Retrieved 15 May 2015. ^ Raghavan, Nikhil (16 April 2011). "Itsy-bitsy". The Hindu. Archived from the original on 15 May 2015. Retrieved 15 May 2015. ^ Pillai, Sreedhar (1 March 2011). "It's cameo craze for Kollywood actors!". The Times of India. Archived from the original on 15 May 2015. Retrieved 15 May 2015. ^ Rajamani, Radhika (6 May 2011). "Tamannaah returns to Telugu films with Sukumar's next". Rediff.com. Archived from the original on 15 May 2015. Retrieved 15 May 2015. ^ "100% Love Movie Review - 100% Entertainment". IndiaGlitz. 6 May 2011. Archived from the original on 15 May 2015. Retrieved 15 May 2015. ^ Narasimham, M. L. (25 December 2011). "Year of family entertainers". The Hindu. Archived from the original on 15 May 2015. Retrieved 15 May 2015. ^ Shekhar (7 June 2012). "Dookudu, 100% Love, Mr Perfect lead SIIMA nominations list". Oneindia Entertainment. Archived from the original on 15 May 2015. Retrieved 15 May 2015. ^ Shekhar (18 June 2012). "Mahesh Babu's Dookudu tops winners list of CineMAA Awards 2012". Oneindia Entertainment. Archived from the original on 15 May 2015. Retrieved 15 May 2015. ^ "The Hyderabad Times Film Awards 2011". The Times of India. 24 June 2012. Archived from the original on 15 May 2015. Retrieved 15 May 2015. ^ "I miss Chennai : Tamannaah". Sify. 5 June 2011. Archived from the original on 15 May 2015. Retrieved 15 May 2015. ^ Kavirayani, Suresh (12 June 2011). "Badrinath Movie Review". The Times of India. Archived from the original on 15 May 2015. Retrieved 15 May 2015. ^ "Badrinath completes 50days in 187 theatres". The Times of India. 3 August 2011. Archived from the original on 15 May 2015. Retrieved 15 May 2015. ^ "CineMAA Awards 2012 Best Heroine Voting". YouTube. MAA TV. 7 June 2012. Retrieved 15 May 2015. ^ Rajamani, Radhika (6 July 2011). "Tamannaah: I am like clay that can be moulded". Rediff.com. Archived from the original on 15 May 2015. Retrieved 15 May 2015. ^ "Venghai Review". Behindwoods. 8 July 2011. Archived from the original on 15 May 2015. Retrieved 15 May 2015. ^ Narayanan, Venkateswaran (8 July 2011). "Venghai Movie Review". The Times of India. Archived from the original on 15 May 2015. Retrieved 15 May 2015. ^ Srinivasan, Pavithra (8 July 2011). "Review: Venghai is tedious". Rediff.com. Archived from the original on 15 May 2015. Retrieved 15 May 2015. ^ Kavirayani, Suresh (7 October 2011). "Oosaravelli Movie Review". The Times of India. Archived from the original on 15 May 2015. Retrieved 15 May 2015. ^ Rajamani, Radhika (7 October 2011). "Review: Oosaravelli is a routine revenge drama". Rediff.com. Archived from the original on 15 May 2015. Retrieved 15 May 2015. ^ "Tollywood Top Heroes Register Hat trick Flops". The Times of India. 9 May 2012. Archived from the original on 15 May 2015. Retrieved 15 May 2015. ^ Rajamani, Radhika (4 April 2012). "'I dont have a glamarous role in Rachcha'". Rediff.com. Archived from the original on 16 May 2015. Retrieved 16 May 2015. ^ "Rachcha review: A paisa vasool movie". Sify. 5 April 2012. Archived from the original on 16 May 2015. Retrieved 16 May 2015. ^ Pasupulate, Karthik (5 April 2012). "Racha movie review". The Times of India. Archived from the original on 16 May 2015. Retrieved 16 May 2015. ^ "Ram Charan's Racha completes 50 days in 127 centers". The Times of India. 23 May 2012. Archived from the original on 16 May 2015. Retrieved 16 May 2015. ^ "60th Idea Filmfare Awards 2013 (South) Nominations". Filmfare. 4 July 2013. Archived from the original on 16 May 2015. Retrieved 16 May 2015. ^ "CineMAA Awards 2013 : Nominations for Best Actor Female". YouTube. MAA TV. 3 June 2013. Retrieved 16 May 2015. ^ "Karunakaran to direct Nithin`s next". Sify. 31 May 2013. Archived from the original on 16 May 2015. Retrieved 16 May 2015. ^ Chowdary, Y. Sunita (10 June 2012). "'Spirited' attempt". The Hindu. Archived from the original on 16 May 2015. Retrieved 16 May 2015. ^ Rajamani, Radhika (8 June 2012). "Review: Endukante Premanta disappoints". Rediff.com. Archived from the original on 16 May 2015. Retrieved 16 May 2015. ^ A. S., Sashidhar (27 September 2012). "Tamannaah turns a hip-hop dance teacher". The Times of India. Archived from the original on 16 May 2015. Retrieved 16 May 2015. ^ "Raghava Lawrence in trouble". The Times of India. 17 December 2012. Archived from the original on 16 May 2015. Retrieved 16 May 2015. ^ Rajamani, Radhika (16 October 2012). "'It was challenging to play a tomboy'". Rediff.com. Archived from the original on 16 May 2015. Retrieved 16 May 2015. ^ Shekhar (17 December 2012). "Pictures: Super-hit Telugu movies at Box Office in 2012". Oneindia Entertainment. Archived from the original on 16 May 2015. Retrieved 16 May 2015. ^ Udasi, Harshikaa (23 March 2013). "On cloud nine". The Hindu. Archived from the original on 16 May 2015. Retrieved 16 May 2015. ^ "'Himmatwala' Review Roundup: Ajay Devgn Starrer Disappoints Critics". International Business Times India. 29 March 2013. Archived from the original on 16 May 2015. Retrieved 16 May 2015. ^ "'Himmatwala' Star Tamannah Fails To Impress Critics in Her Bollywood Debut". International Business Times India. 30 March 2013. Archived from the original on 16 May 2015. Retrieved 16 May 2015. ^ IANS (30 May 2014). "Thank god 'Himmatwala' flopped: Sajid Khan". The Times of India. Archived from the original on 16 May 2015. Retrieved 16 May 2015. ^ "'Thadakha' release on May 10th". IndiaGlitz. 7 May 2013. Archived from the original on 16 May 2015. Retrieved 16 May 2015. ^ A. S., Sashidhar (25 August 2012). "Tamannaah replaces Hansika in Vettai remake". The Times of India. Archived from the original on 16 May 2015. Retrieved 16 May 2015. ^ "'Tadakha' (Thadaka) Review Roundup: Action-Packed Mass Entertainer". International Business Times India. 11 May 2013. Archived from the original on 16 May 2015. Retrieved 16 May 2015. ^ Devi Dundoo, Sangeetha (29 December 2013). "Clichés canned". The Hindu. Archived from the original on 16 May 2015. Retrieved 16 May 2015. ^ Seshagiri, Sangeetha (21 July 2014). "SIIMA 2014 Telugu Nominations: Pawan Kalyan's 'Attarintiki Daredi' Nominated in 12 categories [List]". International Business Times India. Archived from the original on 16 May 2015. Retrieved 16 May 2015. ^ "Veeram will set the tone for me this year - Tamannah". Behindwoods. 2 January 2014. Archived from the original on 16 May 2015. Retrieved 16 May 2015. ^ Karthik, Janani (1 January 2014). "I feel I have an amazing year ahead: Tamannaah". The Times of India. Archived from the original on 16 May 2015. Retrieved 16 May 2015. ^ Seshagiri, Sangeetha (11 January 2014). "'Veeram' Review Roundup: Complete Masala Entertainer for Ajith's Fans". International Business Times India. Archived from the original on 16 May 2015. Retrieved 16 May 2015. ^ Seshagiri, Sangeetha (1 January 2015). "From Vijay's 'Kaththi' to Ajith's 'Veeram': Top Grossing Tamil Films of 2014". International Business Times India. Archived from the original on 16 May 2015. Retrieved 16 May 2015. ^ Seshagiri, Sangeetha (20 June 2014). "'Humshakals' Movie Review: Boring, Over-the-Top Comedy Film". International Business Times India. Archived from the original on 16 May 2015. Retrieved 16 May 2015. ^ "Sajid Khan is in a soup". Deccan Chronicle. 20 July 2014. Archived from the original on 16 May 2015. Retrieved 16 May 2015. ^ "After initial walk out, Tammu does a song for Vinayak's film". The Times of India. 31 March 2014. Archived from the original on 16 May 2015. Retrieved 16 May 2015. ^ "Tamannaah's item song generates good buzz". The Times of India. 5 July 2014. Archived from the original on 16 May 2015. Retrieved 16 May 2015. ^ Sehgal, Geety (22 August 2014). "Tamannaah, a television serial actress, in It's Entertainment and a VJ in Humshakals". The Indian Express. Archived from the original on 16 May 2015. Retrieved 16 May 2015. ^ Rege, Harshada (22 August 2014). "Akshay Kumar is the real king of box office every year". Daily News and Analysis. Archived from the original on 16 May 2015. Retrieved 16 May 2015. ^ PTI (17 February 2015). "'Humshakals' leads nominations list at Golden Kela Awards". The Hindu. Archived from the original on 16 May 2015. Retrieved 16 May 2015. ^ "Tamannaah to play a village belle in Aagadu". The Times of India. 4 August 2014. Archived from the original on 16 May 2015. Retrieved 16 May 2015. ^ Seshagiri, Sangeetha (8 October 2014). "Box Office Collection: 'Aagadu' Beats '1 Nenokkadine', 'Rabhasa' Total Figures". International Business Times India. Archived from the original on 16 May 2015. Retrieved 16 May 2015. ^ "Dashing Tamanna takes a bold step". Behindwoods. 5 April 2015. Archived from the original on 16 May 2015. Retrieved 16 May 2015. ^ Pacheco, Sunitra (10 July 2015). "S S Rajamouli's magnum opus 'Baahubali' releases today". The Indian Express. Retrieved 10 July 2015. ^ "Tamannaah to romance Prabhas in Baahubali". The Times of India. 20 December 2013. Archived from the original on 16 May 2015. Retrieved 16 May 2015. ^ "Tamannaah shed 6 kilos for Baahubali". The Times of India. 22 December 2014. Archived from the original on 16 May 2015. Retrieved 16 May 2015. ^ "Baahubali review: It's best enjoyed when you keep logic far away : Reviews, News – India Today". indiatoday.intoday.in. Retrieved 24 September 2015. ^ "Review: Bahubali is mega, ingenious and envelope pushing!". Retrieved 24 September 2015. ^ "Baahubali crosses 50 days run, nets Rs. 650 crore". The Hindu. 29 August 2015. Archived from the original on 17 October 2015. Retrieved 24 September 2015. ^ "'Baahubali' (Bahubali) Completes 50-Day Run in 600+ Theatres in India: SS Rajamouli Sets Another New Record". International Business Times. 24 September 2015. ^ H. Hooli, Shekhar (1 April 2015). "'Vasuvum Saravananum Onna Padichavanga' to Showcase Tamannaah's Jewellery Designs". International Business Times India. Archived from the original on 16 May 2015. Retrieved 16 May 2015. ^ "VSOP review: Vasuvum Saravananum Onna Padichavanga is a U-rated obscenity". IndiaToday. 14 August 2015. Retrieved 24 September 2015. ^ "Anushka Shetty's Size Zero Friends Include Baahubali's Rana, Tamannaah". NDTV Movies. 17 November 2015. Retrieved 18 November 2015. ^ Kumar, Hemanth (5 November 2014). "Tamannaah is excited to work with Ravi Teja for the first time". The Times of India. Archived from the original on 3 March 2015. Retrieved 1 December 2015. ^ "Tamannaah looks stunning". Deccan Chronicle. 26 September 2015. Archived from the original on 26 September 2015. Retrieved 26 September 2015. ^ "Commercial genre is difficult: Tamannah". DC. 20 December 2015. Retrieved 11 February 2016. ^ "Tamannaah in a special song in Bellamkonda's next". TOI. 31 October 2015. Retrieved 3 January 2016. ^ "Tamannah paid a bomb for an item song". Sify. 11 November 2015. Retrieved 3 January 2016. ^ "Sreenivas-Tamannaah song cost Rs 2.25 crore". The Times Of India. 4 February 2016. Retrieved 5 February 2016. ^ Upadhyaya, Prakash (30 March 2015). "Tamanna Snatches away Karthi-Nagarjuna's Film from Shruti Haasan; How Big is the Loss for Kamal's Daughter?". International Business Times India. Archived from the original on 16 May 2015. Retrieved 16 May 2015. ^ "'Oopiri' wraps up shoot, gears up for release". Sify. 15 February 2016. Retrieved 16 February 2016. ^ "'Oopiri' review round-up: Vamsi Paidipally's film bags positive verdict, rich ratings from critics". International Business Times. Retrieved 27 March 2016. ^ "Tamannaah Bhatia joins sets of Tamil film 'Dharmadurai'". The Indian Express. 6 January 2016. Retrieved 6 January 2016. ^ "Tamannaah charges a bomb for item number"
^ "Abhinetri Tamannaah". DC. 24 April 2016. Retrieved 24 April 2016. ^ "Tamannah Bhatia to join horror bandwagon". DC. 2 February 2016. Retrieved 2 February 2016. ^ "Tamannaah begins shooting for 'Kaththi Sandai'". Sify. 10 May 2016. Archived from the original on 11 May 2016. Retrieved 11 May 2016. ^ "SS Rajamouli's 'Baahubali 2': Shobu Yarlagadda says 'The Conclusion' shoot begins Thursday". 17 December 2015. Retrieved 3 January 2016. ^ "Tamanna takes up the big challenge". 28 November 2016. Retrieved 3 December 2016. ^ Article-Tamil-Tamannah in Kandein Kadhalai Archived 30 October 2009 at the Wayback Machine. Indiglamour.com (17 October 2009). Retrieved on 2010-12-13. ^ "Tamanna to endorse Wipro's Chandrika soap!!". currentweek. Archived from the original on 27 May 2011. Retrieved 21 May 2011. ^ palPalani (23 April 2012). "Tamanna to endorse Fanta!". Southdreamz.com. Archived from the original on 6 October 2012. Retrieved 9 October 2012. ^ "Tamanna Bhatia Poses for PETA To Oppose Animal Tests," OneIndia Entertainment, 17 June 2014. ^ "Tamannaah bags a huge deal - 123telugu.com". 28 March 2015. ^ "Press Note : Tamanna turns brand ambassdor for TV channel - 123telugu.com". 29 March 2015. ^ "Tamannaah Bhatia Takes up a New Role". ^ "Tamannaah to endorse girl power". Deccan Chronicle. 21 January 2016. Retrieved 21 January 2016. ^ "IPL 2018 opening ceremony: Tamanna Bhatia charged Rs 50 lakhs for 10-minute performance as per reports - NewsX". 7 April 2018. Wikimedia Commons has media related to Tamannaah.